On the High Line at the Spur, at 30th St. and 10th Ave.
For the inaugural High Line Plinth, Simone Leigh presents Brick House, a sixteen-foot-tall bronze bust of a Black woman. The torso is a combination of the forms of a skirt and a clay house. 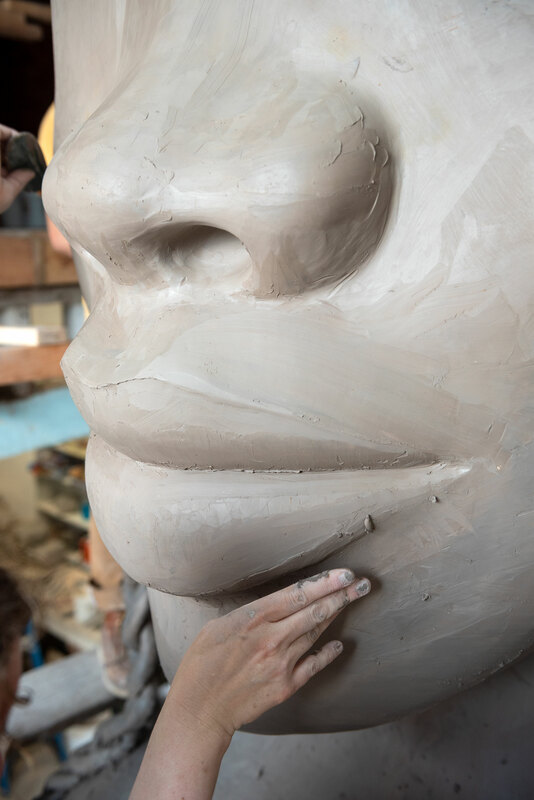 The figure will stand tall and monumental atop the Plinth, gazing resolutely down 10th Avenue. 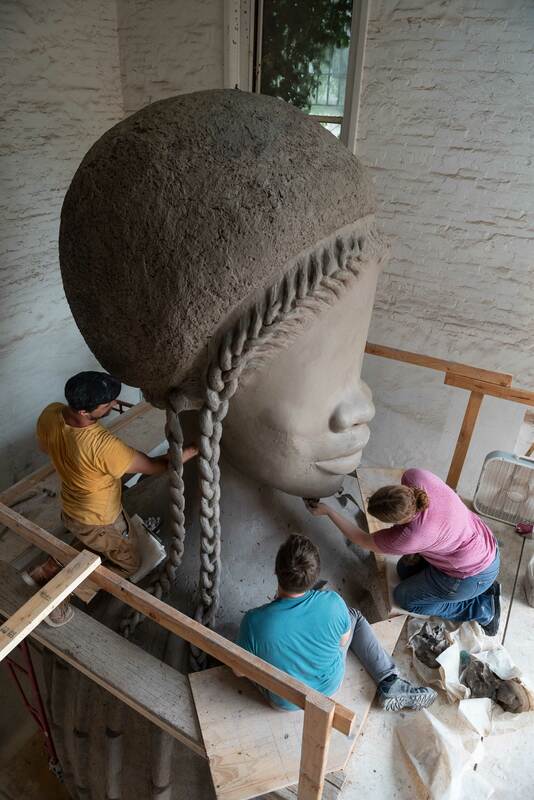 Brick House‘s head is crowned with an afro framed by cornrow braids along the hairline that extend into four braids, each ending with a cowrie shell. The domed shape of the shoulders and bust are adorned with a pattern of elongated ridges. Brick House is the first monumental work in Anatomy of Architecture, Leigh’s continuing series of sculptures that combine architectural forms from regions as varied as West Africa and the American South with the human body. 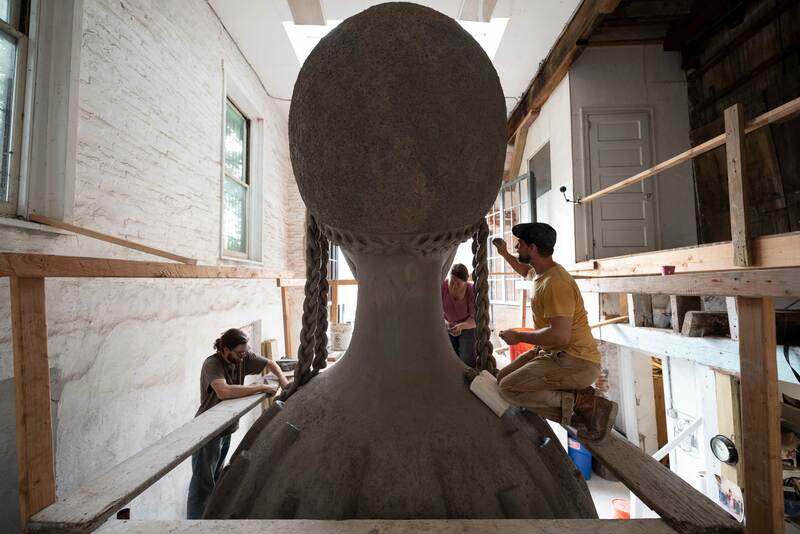 The sculpture references numerous architectural forms: Batammaliba architecture from Benin and Togo; the teleuk of the Mousgoum people of Cameroon and Chad; and the restaurant Mammy’s Cupboard in the southern U.S. All three references inform both the formal elements of the work—the conflated image of woman and architecture—and its conceptual framework. Leigh’s Brick House will be centered on the Spur, standing in sharp contrast to the disparate elements of the immediate architectural landscape. The Plinth is the focal point of the Spur, a site whose architectural and human scales are in constant vertiginous negotiation, surrounded by a competitive landscape of glass-and-steel towers shooting up from among older industrial-era brick buildings. 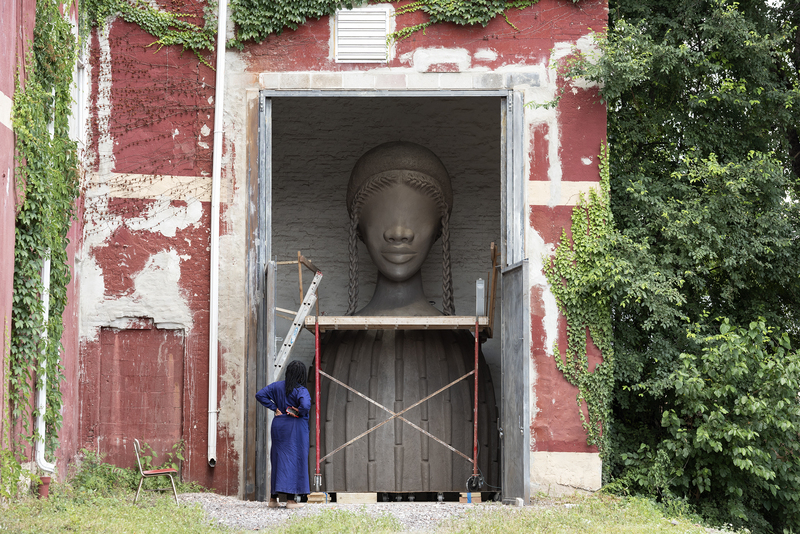 In this space, Leigh’s magnificent Black female figure challenges visitors to think more immediately about the architecture around them, and how it reflects customs, values, priorities, and society as a whole. Read more about the making of Brick House on our blog. Simone Leigh (b. 1968, Chicago, Illinois) lives and works in Brooklyn, New York. Recent solo exhibitions of her work have been presented at institutions including the Hammer Museum, Los Angeles, California (2016); The Studio Museum in Harlem in Marcus Garvey Park, New York, New York (2016); Tate Exchange at Tate Modern, London, United Kingdom (2016); Kansas City Art Institute, Kansas City, Missouri (2016); New Museum, New York, New York (2016); and Atlanta Contemporary Art Center, Atlanta, Georgia (2014). Notable group exhibitions include Trigger: Gender as a Tool and a Weapon, New Museum, New York, New York (2017-2018); Regarding the Figure, The Studio Museum in Harlem, New York, New York (2017); Round 46: BWA for BLM, curated by Leigh, Project Row Houses, Houston, Texas (2015); The Grace Jones Project, Museum of the African Diaspora, San Francisco, California (2016); Unconventional Clay: Engaged in Change, the Nelson-Atkins Museum of Art, Kansas City, Missouri (2016); Greater New York, MoMA PS1, Long Island City, New York (2015); and Radical Presence: Black Performance in Contemporary Art, traveling to Contemporary Arts Museum Houston, Houston, Texas; Grey Art Gallery, New York University, New York, New York; Studio Museum in Harlem, New York, New York; Walker Art Center, Minneapolis, Minnesota; Yerba Buena Center for the Arts, San Francisco, California (2012-2015). 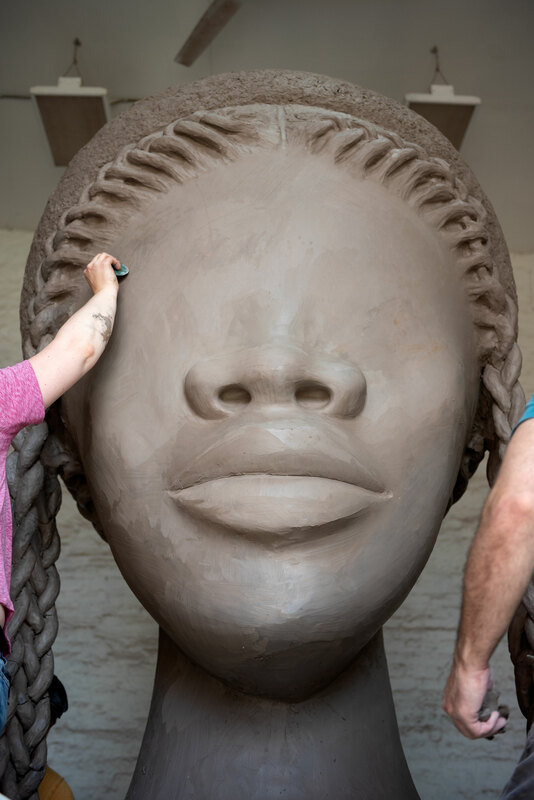 Leigh’s work has been presented in international group exhibitions including Dak’art 2014, the 11th Biennial of Contemporary African Art, Dakar, Senegal (2014) and the Whitney Biennial, Whitney Museum of American Art, New York, New York (2019, 2012). Major support of the High Line Plinth comes from a dedicated group of contemporary art leaders and philanthropists. The High Line Plinth Committee is committed to realizing significant commissions and the public success of the Plinth. It includes Shelley Fox Aarons, Fairfax Dorn, Andrew Hall, Hermine Riegerl Heller, J. Tomilson Hill, Dorothy Lichtenstein, Donald R. Mullen, Jr., Mario J. Palumbo, Jr, and Anonymous.